The 55+ community of Horizons at Barnegat is surrounded by “The Pine Barrens,” a vast expanse of pine trees spanning almost 1.1 million acres. Living in such close proximity to the massive forest, residents are always concerned about the dangers of wildfire, especially after a massive fire in 2007 burned 17,000 acres of woodland near Horizons. After the blaze, residents decided to take action by becoming a recognized Firewise community in 2008. Since then, Horizons has made substantial advances in preventing another wildfire from occurring, engaging in various mitigation and advocacy efforts. Due to their continuous hard work, Horizons at Barnegat became one of five winners of the 2013 Firewise Challenge, earning $5,000 to put towards future Firewise efforts thanks to the generous support of State Farm, NFPA’s partner in the Firewise Challenge. To discover more about the Horizons at Barnegat community became a winner of the Firewise Challenge, read their full story here! I noted in my calendar recently that the first anniversary of the Yarnell Hill Fire was approaching. As I thought about what I would write in our Fire Break blog about the incident, I happened to visit NIFC’s (National Interagency Fire Center) website (for something else completely) and saw their announcement on the homepage about designating this week, the week of Monday, June 30 – Sunday, July 6, as “A Week to Remember, Reflect and Learn,” to honor the memories of all fallen wildland firefighters, and to reflect on lessons learned from different types of wildland fire accidents. I thought, what a wonderful way to commemorate those who have dedicated their lives to the safety of others. And so, I wanted to share this with all of you. According to the announcement, which was sent out from the National Wildfire Coordinating Group (NWCG), this week also marks the 20-year anniversary of the South Canyon Fire that started on July 6, 1994 and took the lives of 14 wildland firefighters on Storm King Mountain near Glenwood Springs, Colorado, and as I mentioned above, the one-year anniversary of the Yarnell Hill Fire, which ignited on June 28 near Prescott, Arizona and killed 19 members of the Granite Mountain Hotshot Crew on June 30, 2013. As the announcement goes on to say, while the accidents happened 19 years apart, they are still bound together by several tragic commonalities. So this week, let's all take a moment to remember and reflect … and together, let's pledge to continue our fight to help make our world a safer place from wildfire. Surrounded by the steep expanses of the western Klamath Mountains lies the community of Orleans, CA, a region rich with biodiversity. Despite recently joining the ranks of Firewise communities in 2011, Orleans has been working tirelessly since 2001 to defend the area from wildfires. Teaming up with the local volunteer fire department along with the Karuk Tribe, a Native American tribe that has lived in the area for thousands of years, the Orleans community has taken strong actions against wildfire that has ultimately protected the entire area. Due to their dedicated efforts, Orleans was recently announced as one of five winners of the 2013 Firewise Challenge, earning $5,000 to put towards future Firewise efforts thanks to the generous support of State Farm, NFPA’s partner in the Firewise Challenge. To find out more about how the Orleans community became a winner of the Firewise Challenge, read their full story here! This Monday, June 30 marks the one year anniversary of the tragic day when 19 members of the Granite Mountain Hotshot crew were killed outside Yarnell, Arizona in the Yarnell Hill Fire. To honor their loss the City of Prescott AZ is observing the anniversary with a moment of silence and ringing of the bell at 4:42pm; along with an honor guard ceremony beginning at 4pm. A reading of the names of the 19 firefighters that perished will be read by Patrick McCarty, a former Granite Mountain Hotshot; along with words from newly appointed Prescott Fire Chief Dennis Light. Take just five seconds right now and add an entry into your electronic calendar and join the residents of Yarnell in paying tribute to these 19 firefighters at 4:42pm (MST) on Monday, June 30. Tribute hike: Participants will follow members of the Prescott Fire Department along the Thumb Butte Trail, a popular workout spot for the Granite Mountain Hotshots at 9am on June 30. The hike to the summit takes approximately 45 minutes. "A Fire Department Remembers": An exhibit honoring the lives of the 19 fallen Granite Mountain Hotshots will be on display from June 29 – July 5 at the Hotel St. Michael. The exhibit includes items left outside the team's base at Fire Station 7. Tribute Fence Preservation Project: Arizona State Library, Archives and Public Records and Prescott Public Library will unveil a virtual museum containing some of the more than 10,000 items collected and archived from the fence at Station 7 – the former home of the Granite Mountain Hotshots. 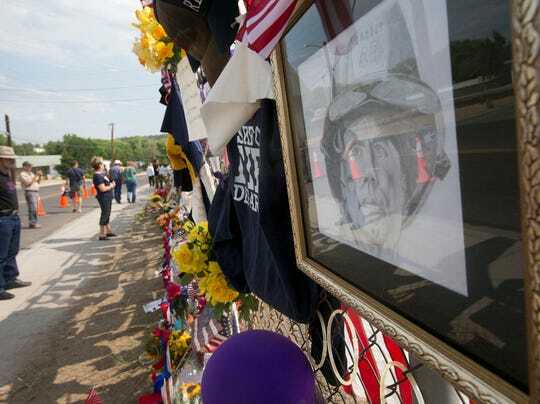 Hundreds of visitors left t-shirts, photos, artwork, candles, crosses and more that filled a chain-link fence surrounding the station. The digital project debuts June 30. Please share this blog with your Facebook, Twitter, LinkedIn and email friends and ask them to also add it to their calendars, and to share it with their friends too. Let's all take time to honor their lives with a simple moment of silence! Living in a densely wooded area, while naturally beautiful, presents a wide range of potential dangers involving wildfire. The community of Forest Ridge, WA, however, decided to tackle that problem head on when they became a Firewise community in 2010. Along with four others, Forest Ridge was recently announced as a winner of the 2013 Firewise Challenge, earning $5,000 to put towards future Firewise efforts thanks to the generous support of State Farm, NFPA’s partner in the Firewise Challenge. To learn more about how the Forest Ridge community became a winner of the Firewise Challenge, read their full story here! Today marks the one year anniversary of the tragic day when 19 members of the Granite Mountain Hotshot crew were killed outside Yarnell, Arizona in the Yarnell Hill Fire. The city of Prescott AZ is observing the anniversary with a moment of silence and ringing of the bell at 4:42pm; along with an honor guard ceremony beginning at 4pm. A reading of the names of the 19 firefighters that perished will be read by Patrick McCarty, a former Granite Mountain Hotshot; along with words from newly appointed Prescott Fire Chief Dennis Light. Post-fire studies, experiments and models show that homes ignite due to the condition of the home itself and everything around it within 100-200 feet. Embers from a grass, brush or forest fire can reach homes on the wind and ignite flammable objects on or around the home. Embers can also blow into attic vents, open windows, under decks and into nooks and crannies on the roof. With this information in hand, many homeowners continue to work on creating "defensibe space" around their property as a way to reduce their home's vulnerability from potential ignition.Projects like cleaning out gutters, raking leaves and clearing dead debris from the yard and moving wood piles away from the home are just a few of the many simple and easy steps residents can take everyday that really make a difference. But many people have asked us lately and rightly so... "OK, so while mitigating risk in my own home ignition zone is great, what if I live closer than 100 - 200 feet from my neighbor, and they haven't done any mitigation work? To be safer, shouldn't everyone be creating defensible space ... together?" Well, we're glad you asked. And the answer is a resounding "yes!" The latest home ignition zone graphic, developed byNFPA, shows what this scenario looks like. It's also part of an updated web page that highights the "why" of creating defensible space and provides talking points that can help youget the discussion started with friends and neighbors. Check out the new page today! For more information about action steps you can take, NFPA provides aFirewise checklist for homeowners and asafety tips sheet that are both easy to download and print! Hemlock Farms, PA wins Firewise Challenge! The community of Hemlock Farms, PA was recently announced as one of five winners of the 2013 Firewise Challenge. Having been a recognized Firewise community since 2006, Hemlock Farms has made great strides in both wildfire advocacy and mitigation efforts, sharing information with neighbors and carrying out various Firewise activities that have ensured the safety of the neighborhood from the dangers of wildfire. As a winner for the Challenge, Hemlock Farms has earned $5,000 to put towards future Firewise efforts thanks to the generous support of State Farm, NFPA’s partner in the Firewise Challenge. To read more about how the Hemlock Farms community earned their place as a winner of the Firewise Challenge, check out their full story here! At the 2013 Backyards and Beyond conference in Salt Lake City, I had the honor of meeting Jessica Santoyo with the Eureka County Natural Resources Department in Nevada. She shared a unique youth program in their county where the local high school’s chapter of the Future Farmers of America (FFA)* works on an annual Firewise project. It was one of those testimonials that immediately resonates as as an exemplary out-of-the-box example of how youth can have a role in learning about Firewise; and how they can make a positive contribution to their community. The students grow fire resistant plants in their school’s greenhouse as a class project and in turn they learn about fire resistant species and their benefits. When the plants are ready the local Firewise program purchases them and gives them out at no cost during an annual event, which this year was held on May 3 – Wildfire Community Preparedness Day. Students create posters depicting what they learned about fire resistant plants and those are prominently displayed at the event and they also staff the booth where the plants are distributed. They can count their volunteer time as community service hours for FFA or scholarship applications. This year’s event engaged 50 volunteers and attracted more than 250 attendees. *The National FFA Organization is a dynamic youth organization that changes lives and prepares students for premier leadership, personal growth and career success through agricultural education. An example of what works well in education, FFA is an intracurricular organization that implements the three-circle model of education – classroom instruction, hands-on learning and leadership development through FFA programs. Taking steps to combat the threat of wildfire was a key theme around the 2013 Firewise Challenge. Participating communities not only played an integral role in reducing wildfire risk but they also encouraged more residents to take action in their own areas. Contacts from each of these winning communities took some time out recently to talk with Ryan McGinnis, NFPA's public affairs intern, about why participating in this Challenge was important to them, and the plans they have to continue their wildfire mitigation work in the coming months and year ahead. Read their winning stories on our Firewise success stories page. This year, from June 22rd to 28th, the National Weather Service is commemorating Lightning Safety Awareness Week. This is an important educational week for them, and us, because summer is the peak season for one of the nation's deadliest weather phenomena--lightning. Though lightning strikes peak in summer, people are struck year round. In the United States, according to the latest NFPA report, local fire departments respond to an estimated average of 22,600 fires per year that were started by lightning. In addition to the fires reported to local fire departments, federal and state wildland firefighting agencies reported an average of 9,000 wildland fires started by lightning to the National Interagency Fire Center per year in 2008-2012. These fires tended to be larger than fires started by human causes. The average lightning-caused fire burned 402 acres, nine times the average of 45 acres seen in human-caused wildland fires. The National Weather Service has provided many educational resources on their website, including information on safety, science, myths and facts. In addition, NFPA offers lightning safety tips in an easy to read tip sheet. Check them out above or download these NFPA safety tips on lightning. When my colleague and good friend LisaMarie from NFPA’s Public Affairs office suggested a Wildfire Community Preparedness Day 2014 photo album to showcase the awesome pictures we received from dozens and dozens of May 3 activities throughout the nation, I totally cringed. Don’t get me wrong, I loved the idea of sharing the amazing photos participants took the time to share – but I still have my grown kid’s photos from when they were babies stuffed into shoeboxes and over flowing bins. Photo albums are just something I’ll never hear someone say is one of my strengths. Like a knight on a white horse rushing in to my rescue, our talented, organized and efficient social media staff (whom I think very highly of) swooped in to make LisaMarie’s vision a reality. Soon after the photos were in their possession they had them posted and ready for the world to peruse. When I opened the photo album for the first time a wide smile crossed my face from ear-to-ear; much like what I’m sure will happen someday twenty years from now, when my personal photos finally reside in some sort of organized fashion. It gave me goose bumps to ponder the amount of work and time that organizers and volunteers alike committed to achieving an astounding amount of wildfire preparedness work. It was a moment when you fully realize the combined impact that the more than 100 diverse wildfire awareness, education and mitigation projects undertaken that day had on communities everywhere. I believe the word hero can be and is often overused, but in this case the participants from these events have become my May 3 heroes! They accepted and acknowledged that they live in an area with a wildfire risk and took personal action to reduce its impacts. Without further delay, I want you to take a look at what took place that day too; grab an ice tea and your laptop and browse through the photo album and try to comprehend the massive benefit of the efforts that occurred across the country from Florida to Hawaii. I’m convinced you will instantly be impressed and motivated, so don’t be surprised when you find yourself jotting down notes and cultivating ideas to get you started in planning your neighborhood’s 2015 Wildfire Community Preparedness Day activity! Our sincere thanks to State Farm for their generosity in providing campaign funding and twenty project awards to communities to implement projects. NFPA Conference & Expo education sessions have kicked off this morning and one of the first attendees got a chance to sit in was done by Casey Grant of the Fire Protection Research Foundation. Casey's presentation covered an ongoing Foundation research project funded by NIST, titled, "Creatng the research road map for the smart firefighter of the future." The key concept of this project, SMART, refers to specific, measureable, attainable, relevant and timely items. Gathering of data (using sensors), processing the data (computation), and use of the data (targeted decision making) are the three areas that the world of cyber physical systems cover. As a point of reference, in 2013, we produced 5 exabyte of data every 10 minutes, however from the dawn of civilization to 2003, humankind generated 5 exabytes of data in total, so you can see the progression of how much faster and more readily available this information is becoming. Smart clothing, augmented reality, robotics, satellitel information, drones, smartphone apps, fully interoperable equipment are all examples of smart, data rich tools that firefighters may use to make their jobs safer, more efficient, or reducing loss of lives and property. PPE and equipment, apparatus and equipment, building systems, and infrastructure & community data systems can be utilized to gather this data. To learn more or stay up to date on future research, the project's status and information is available on the Foundation website. Download the handouts for Casey's presentation on smart fire fighting through the Conference website (registration required). On Monday, near the New Mexico-Arizona border, residents of two Native American communities were forced to evacuate as strong winds fueled the flames of a wildfire burning in the Chuska Mountains. The Assayii Lake Fire has burned around 17 square miles, prompting Navajo Nation police to issue an evacuation order for parts of Naschitti and nearby Sheep Springs. About 400 people live in the area, and according to fire managers, many have been put on notice that more evacuations could be possible. News reports say that state and federal land managers have been warning people to be careful because of the dry conditions that have covered the state over the past four years. Moderate to severe drought conditions cover more than 95 percent of the state, including portions of the Navajo Nation in northwestern New Mexico, which has already seen more than 400 fires burn nearly 10,000 acres, according to the National Interagency Fire Center. More information regarding what residents can do before a wildfire threatens your area including Firewise tips and resources can be found on the Firewise website. NFPA also has information about what you can do during the time a wildfire is in your area and after a wildfire is contained, Find these on NFPA's wildland fire web page. A wildfire burning in the Sequoia National Forest in central California has set evacuation notices into play for around 500 homes. By late last night, the Shirley Fire came within a mile of a community about 30 miles northeast of Bakersfield and recent news outlets have reported the fire has burned close to 2,000 acres. Thankfully, there are no reports of injuries as the firefighters were able to keep the fire from spreading any closer to the neighborhoods there. Once again, hot, dry weather has blamed for the outbreak of this and other fires that have burned across California in recent months.To date, California has already seen more than 2,000 fires burn more than 18,000 acres, according to the National Interagency Fire Center. With continued drought conditions and higher temps, the state is already bracing for a long and extreme fire season. For information about how you and your family can stay safer from the threat of wildfire in your area, check out the Firewise Communities Program website. There you'll find checklists, action steps and general wildfire safety information that can help you stay a whole lot safer this summer. Take a look today! !http://a3.typepad.com/6a0105362f46aa970c01a511ceb083970c-800wi|border=0|src=http://a3.typepad.com/6a0105362f46aa970c01a511ceb083970c-800wi|alt=ChinoHillsInside|width=576|title=ChinoHillsInside|class=asset asset-image at-xid-6a0105362f46aa970c01a511ceb083970c image-full img-responsive|height=486! I had a great opportunity last week to spend valuable time with California partners including the&#0160;[California Fire Safe Council | http://www.firesafecouncil.org/] staff (who serve as the state&#39;s&#0160;[Firewise liaison | http://submissions.nfpa.org/firewise/fw_state_liaisons.php]) and staff of the&#0160;[Sacramento Metro Fire District | http://metrofire.ca.gov/] (who have hosted numerous offerings of NFPA&#39;s&#0160;Assessing Wildfire Hazards in the Home Ignition Zone workshop). Luckily I was also near a place that is an excellent example of a local Fire Safe Council using&#0160;Firewise principles&#0160;and the&#0160;[Firewise Communities/USA Recognition Program | http://www.firewise.org/usa] with great success. Not only did the district welcome us warmly, the folks involved also gave us a crash course in how a motivated community gets things done. We reviewed a Community Wildfire Protection Plan (CWPP) document created by volunteers that was one of the more readable and action-oriented local plans that I have encountered. They showed us photos of a recent fuel reduction project on Carbon Canyon Creek accomplished by partnering with the Santa Ana Watershed Association for a win-win-win-win on fire safety, environmental quality, flood control and community amenity. We also saw an illustrated list of recent accomplishments, from fire safety signs to brush clean-up days to fire safe gardens to invasive weed removal. Jim Powderly reflected on how the local Fire Safe Council embraced Firewise and in return earned not only the formal recognition, but also the respect of the city council and others for this small &quot;bedroom&quot; community which helped in its partnerships and accomplishments. This is one area that is truly on its way to being a Fire Adapted Community . A big thanks to Jim and his crew of staff and volunteers for sharing these wonderful successes! Look for more about Firewise success stories in California coming soon. Don't miss out on your opportunity to "Ask the Expert" by participating in our upcoming virtual workshop on July 15th. The workshop will teach you about how embers ignite roofs in a wildland fire and how to make your roof more survivable. Join Firewise residents throughout the country through a one-hour format including a thirty minute presentation by Dr. Stephen Quarles, Ph.D. from IBHS, followed by a thirty minute live “Ask an Expert” interactive opportunity for pre-selected homeowners to ask a question related to the session’s topic. This unique learning format provides wildland/urban interface homeowners with information on how to make important mitigation modifications at their homes. Participation is limited to the first 100 registrants. Register now for the virtual workshop on July 15th at 1:00pm EDT. Mark your calendars for the next “Ask an Expert” Virtual Workshop and join us August 19 at 2pm MDT for Mulch Combustibility – Choosing the Right Type for Your Wildland/Urban Interface Home. Pre-registration information will be available following the July 15 session. Despite the large number of traumatic and burn injuries that occurred in those incidents, stress and other medical-related issues, which usually result in heart attacks or other sudden cardiac events, continued to account for the largest number of fatalities. One-third of the deaths resulted from overexertion, stress and related medical issues. Of the 32 deaths in this category, 29 were classified as sudden cardiac deaths (usually heart attacks), one due to a cerebral aneurysm, one to a stroke and one was a suicide. For more wildland fire reports and statistics, check out NFPA’s wildland fire “reports, case studies and guides” page. As a reader of this blog you frequently learn about the many high caliber workshops, trainings and conferences NFPA offers year-round for a wide range of wildland/urban interface stakeholders. Now residents in Firewise Communities/USA® sites throughout the nation can participate in a workshop directly from their kitchen table or home office through a unique learning opportunity being delivered in a virtual format. These one-hour workshops include a thirty minute presentation by a subject matter expert along with a thirty minute live “Ask an Expert” interactive opportunity for pre-selected homeowners to ask a question related to the workshop’s topic. This learning format provides wildland/urban interface homeowners with information on how to make important mitigation modifications at their homes. It’s with great excitement that Dr. Stephen Quarles will be the featured presenter and “Ask an Expert” for both the July and August topics. Steve is a senior scientist withthe Insurance Institute for Business & Home Safety where heassists with research on building performance with regard to wildfire and moisture exposures. Prior to joining IBHS, he worked for the University of California where he addressed durability and in-service performance issues of wood-frame buildings, particularly those subjected to wildfires. You’re invited to join Firewise Communities/USA® residents throughout the country in this special virtual workshop event! Participation is limited to 100 “live attendees” so please register ASAP –we anticipate the sessions will fill quickly. So don’t delay signup today. Following the live workshop, the workshop in its entirety will be available for viewing at www.firewise.org. Pre-registration for the live August 19 session will be available following the July 15th event. So here we are in the heart of campfire season and this advice the Association gives to Oregonians would be great to pass along to anyone planning on camping this summer. Please do your part to keep the number of human-caused wildfires to a minimum (heck, let's knock wildfires right out of the park for good!). Before you head out to a campsite, review some of the information below, and then visit the Association's website for the full list of "do's and don't's" you will want to follow. Once you're there, you also find campfire safety video clips and wildfire prevention information. For those of you living in other states, your state forestry website provides information about safe campfire practices and any additional, state-specific information you need to know regarding wildfire safety. And of course, our friend Smokey Bear offers lots of great tips and advice for everyone, including kids. Please check these resources out. You'll be glad you did! Thank you, everyone, and please stay safe! Today is the one-year anniversary of the Black Forest Fire - the most destructive wildfire in Colorado’s history. In recognition of the anniversary, Denver’s CBS4 is airing a half-hour special that will provide important information for residents everywhere living in an area with wildland fire potential. In addition to the Black Forest Fire, they’ll take a look back at the South Canyon Fire on Storm King Mountain near Glenwood Springs, CO that killed 14 firefighters. The 20th anniversary of that tragic fire is July 6. Viewers will also learn about the science of wildfire, mitigation and how firefighters fight flames from the air. The special segment airs at 6:30pm MDT and will also be available on their website. Dispatches from Mandalay – “Clearing a path for people with special needs clears a path for everyone,” was the message on Tuesday at NFPA C&E from Alan Fraser, Senior Building Code Specialist with NFPA. In his well-attended session on emergency evacuation planning and the 20% of the population missed, Fraser explained to the audience that we must consider what evacuation means to us when we become disabled, and not if we become disabled. Often referred to as, “people with access and functional needs,” Fraser explained that, in addition at-risk populations like children and the elderly, approximately 56 million Americans deal with speech, hearing, sight, mobility, or cognitive challenges that complicate their ability to receive and respond to evacuation calls. In wildland fire, whether it be a half-acre leaf fire in a housing development, or a multi-thousand acre “media fire” out west, the risk to residents and resources remains the same. The ability for all residents in a community to receive important information and have the ability to act upon it in a timely manner is important for their wellbeing, and that of public safety personnel moving into effected areas. Fraser stressed that in the, “emergency evacuation cone of response” – which starts at the individual and builds out past the home and community, to jurisdiction and beyond depending upon the risk – the role that each resident can play and the requirements for necessary communication between levels and local actors must be identified and connected before an event occurs. Fire Adapted Communities strongly promotes such interaction and dialogue between the various audiences that face the common threat of wildfire. Learn more about the role you can play and the connections you can make with others in your greater community. One of the great things about my job is the amazing people I get to meet and learn from through our outreach, advocacy and training sessions. Last week my colleague Hylton Haynes and I traveled to Billings, MT where we spent the day delivering a Firewise Principles and Community Risk Assessment Training at the Interagency Dispatch Center. Acknowledging the similarities and also the distinct differences in communities tackling proactive mitigation and prevention initiatives continues to provide insight and opportunities to evaluate the tools and resources our division provides. The group we met and worked with in Billings challenged us to think outside the box and to be cognizant that communities will always have situations unique to them, but through meaningful conversations, networking and constructive problem solving everyone can leave with invaluable takeaways as we continue to learn from our fellow WUI stakeholders. Our thanks to Jeff Moyer with the BIA Rocky Mountain Regional Office for coordinating the session and for his determination and perseverance in making the training come to fruition. According to recent news reports, about 50 homes northwest of Bend in central Oregon remain under an evacuation notice after two fires that ignited Saturday near Tumalo Reservoir joined together, burning nearly 6,800 acres of brush and timber. Thankfully, the Two Bulls Fire has not caused any injuries or serious structure damage to date, and families from about 200 homes were allowed to return home late Sunday, though they remain on “stand by” should fire officials request another evacuation order due to dangerous and changing conditions. The Oregon Department of Forestry states on its website that the factors that contributed to a devastating wildfire season in 2013 are once again threating the state and could lead to a very active fire season this year. Factors like drought, dried fuels and lightning are being blamed for the increase of wildfire activity not only here in Oregon, but across the western half of the country as well, so early in the year. For those who remember, in 2013 powerful thunderstorms with little rain ignited several large fires in southwestern and central Oregon leading to the worst season in 60 years on state-protected lands. If widespread dry lightning occurs in 2014, say officials, Oregonians should expect another active fire season. And well, even if we can't invent a machine that could control the weather (think thunderstorms) that leads to lightning-caused fires, we, as residents, can help reduce the number of human-caused fires in our area, take action to help prepare for a wildfire event and reduce our risk for damage, as best we can. NFPA has a great webpage that provides steps you can take before, during and after a wildfire. Check it out. Want something you can download? Our safety tips sheet and Firewise homeowners checklist are pefect to print out and stick to your fridge. With this wildfire season starting so early in the year, why don't we all make a pledge to help our families, friends and neighbors stay safer this summer. Find tips on wildfire preparedness and prevention, campfire safety, using equipment responsibly, fire-resistant landscaping and creating defensible space around your home on the Firewise and your state's department of forestry websites. Photo courtesy of KATU/Portland, Oregon. Dispatches from Mandalay – As the first full day of NFPA C&E comes to a close, we want to share with you two well received wildland fire presentations from Monday morning. Recent research into the vulnerability of attic and foundation vents against wind-blown embers was discussed by Steve Quarles, Senior Scientist, and Murray Morrison, Research Engineer, both with the Insurance Institute for Business and Home Safety (IBHS). Post-fire surveys of destroyed and damaged buildings have indicated that ember entry through vents have resulted in structural ignitions. Quarles and Morrison shared with the audience results of experiments conducted earlier this year at the IBHS Research Center in South Carolina that evaluated the vulnerability of vents in structures to wind-blown embers. Learn more about what you can do to make vents around homes less vulnerable to embers. Later in the morning, Viejas, CA, Fire Chief Donald Butz, and Sheryl Landrum, District Manager of the RCD/Fire Safe Council of San Diego County, gave attendees a step-by-step plan for preparing a Community Wildfire Protection Plan. They shared their experiences on community outreach, plan development, and focused sustainment. Learn more about the CWPP process and how your community can benefit from this preparedness approach. Monday evening saw a packed crowd on the exhibit show floor. Booth #438 has information and resources from The Firewise Communities Program; NFPA's Wildland Fire Division; the National Ready, Set, Go! Program; research from IBHS; and Fire Adapted Communities. Come visit us on the show floor and we’ll share more news here about the booth on Tuesday. Back by popular demand: firefighting goats! Goats make great video, as I found out after being quoted in USA Today in an article a couple years ago. Data on goats and wildfire is challenging to quantify, as I also found out during my interview with the USA Today reporter. Some people find the whole notion of goats chewing up the fire hazard fairly intriguing but also mildly silly. Silly or not, everyone from federal land managers to major utility companies to homeowners associations seem to be using goats as a fire management alternative. Goats embrace technology, including online crowdfunding, to ensure they have jobs down the line. KRDO TV in Colorado reported on yesterday's field tour by members of the national Fire Adapted Communities Learning Network at their annual meeting near Colorado Springs. There are currently 18 Fire Adapted Communities network participants from all over the U.S.
Woodland Park, northwest of the city of Colorado Springs, is one network hub where a lot of wildfire safety education and action has been ongoing for years. The area is home to five recognized Firewise Communities/USA sites and is also home base for the Coalition for the Upper South Platte, a strong proponent of wildfire mitigation in the context of watershed health. Check out the story and video featuring a demonstration home in the area! Image from KRDO.com features the home of Woodland Park resident Jim Ignatius. If you live or work in the Sacramento area, don't miss the final in a series of great workshops sponsored by the Sacramento Metropolitan Fire District (Metro Fire) next week on June 13-14. The fire district is in the process of creating a Community Wildfire Protection Plan (CWPP), and secured a Federal Emergency Management Agency (FEMA) grant to host a series of NFPA's Assessing Wildfire Hazards in the Home Ignition Zone seminars. Taught by NFPA instructors and closely aligned with NFPA wildfire safety standards, this course provides participants with a solid understanding of how homes ignite during wildfires and effective techniques to minimize danger and damage. Find all the details on the course and how to register here. We just received news from our colleagues in our NFPA Washington, D.C. office that there will be a Senate Hearing on wildfire today (June 5) at 2.30 PM EST. The Agenda: Given the increasing prevalence of wildfires, primarily in the Southwest and West, it is important that Congress takes a comprehensive look at the training and resources currently provided to firefighters and first responders in at-risk communities. According to the notice, the hearing, hosted by the Subcommittee on Emergency Management, Intergovernmental Relations and the District of Columbia, will "bring together leaders from state, local and federal levels to assess present capabilities and discuss ways to ensure robust and adaptable fire prevention and response throughout the country." To watch the webcast of this hearing, go to http:/www.hsgac.senate.gov/. A recent article in Insurance Journal highlights how California's early and dramatic wildfire season has prompted property owners to check in with their insurance carriers on fire coverage and safety. Western editor Don Jergler's article, "Wildfire Publicity Lights Fire Under California Homeowners," documents the flurry of calls and requests for review of insurance coverage by California residents concerned about their home's survivability in the face of wildfire. It also details some of the newer products provided by some insurers in the form of assistance with wildfire preparation and mitigation, and even individualized fire protection and suppression. It's great news that property owners are checking on their insurance coverage. While about 97% of property in the U.S. carries insurance, recent estimates state that 2 out of 3 homes are underinsured. In the face of a potential total loss of one's property, the majority of homeowners may only recoup 78% of their loss in insurance claims due to inadequate insurance coverage. After hearing from author Linda Masterson and reading her book Surviving Wildfire, it is frightening to realize that many of us may have a potential financial disaster looming due to lack of awareness about what our insurance policy covers and does not. Linda's website provides a great list of "insurance myths" you can check out. Insurance information groups including the national Insurance Information Institute (III) and the Insurance Information Network of California (IINC) recognize this looming problem and provide great resources for homeowners to use to check on their coverage levels, including the video above from III, and this resource page from IINC. I came across this interesting (and almost frightening) report from AZCentral and reporter Caribe Devine. It explains what some residents have been seeing more of this fire season - fire devils, or what is more commonly known as fire whirls or fire tornadoes. Most recently, fire whirls were spotted in southern California and captured on video from surprised and fascinated viewers who then shared it with people around the world. Read the article and check out the video. Have you spotted a fire whirl in your area? Let us know. And remember, this fire season, keep you and family safe from wildfire. Check out our Firewise Communities Program and safety tips sheet to help you get started.